Back in the 90s, Mirage Studios published a series of TMNT collected books that, err ... collected some of Mirage's TMNT comic book stories. Seven volumes were published and all seven volumes featured brand new art created exclusively for those covers by A.C. Farley. 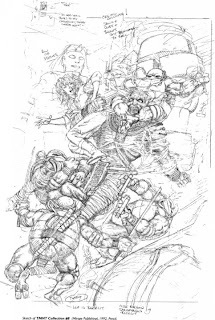 However, before the series of books got canceled after the seventh volume, Farley had sketched out the cover for what would have been volume 8. This volume would have included Mark Bode's Egyptian story (TMNT #32). And Mr. Farley was kind enough to share this sketch today on his Facebook page. Too bad it wasn't to be!